The X-Factor semi-finals are upon us with only 4 acts are left standing from the 12 that made the live shows. The elimination of Tamera has been the biggest shock to date, but over the last 3 or 4 weeks, it’s understandable that she never made it through. She was 3/1 favourite at the beginning and as short as 17/10 in week 4, but her fall from grace doesn’t mean that’s the last we’ll hear from her. I fully expect Tamera to be more successful than any of the 4 remaining acts and there’s a piece of me that believes she’ll have a little more credibility making it as a singer than if she was to win the X-Factor. As it stands in Semi-Final week, the bookies have Sam as the biggest favourite ever to grace the X-factor. She’s been odds on for a long time and is 1/3 now with 4 left. By all means, back her if you think she’s going to win. She’s never been in the bottom 2, and has never really put a foot wrong, but all that means is that she has never received one of the 2 lowest number of votes. You can count Nicholas in that category too. Anyone remember Christopher Maloney from last year? He topped the polls for the first 7 weeks before James Arthur took over. We can’t be sure that Sam is as dominant as it could easily be Nicholas. Here’s the betting as it stands. X-Factor is a funny old game. 2 weeks ago Hannah smashed it while Tamera was dreadful, but Tamera escaped the bottom 2 and Hannah was sent home. Last week, Rough Copy were dreadful and escaped the bottom 2, while Luke ousted Tamera in the basement battle to send her home with one of the best sing offs of this or any series. The theme this week is ‘Beyonce and Elton John Week’ with each act performing a song from each of the artists. 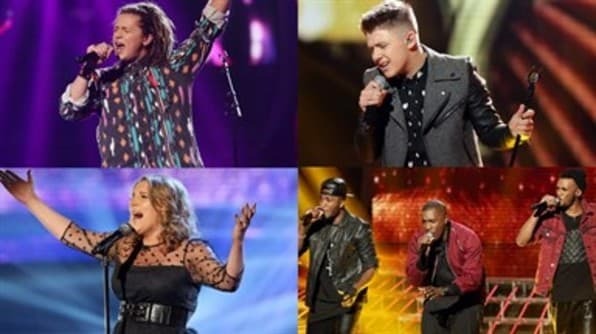 It’s a strange theme and it’s possible it was put in place to help seal Tamera’s spot in the final, but that’s backfired on them so let’s take a look at which songs each artist is performing. The Beyonce song should be great and that’s not in doubt. She will hit the high notes without any trouble and even if she’s not as brilliant on the more mellow parts of the song, it shouldn’t make any difference. Candle in the Wind should be a walk in the park for her. It’s a good song choice and she’ll hit every note. There’s not many surer things than Sam having a place in the final after this performance. Just a note. A few years ago when Journey South sang that song, Sharon was very vocal about it being disrespectful because Elton John doesn’t even sing it anymore, so I wonder why she’s changed her tune and will Louis (most likely) mention it? I like Rough Copy’s song choices and they are definitely the best songs of all the artists as it will give them room to have some fun and make the songs their own, but they’ll need to be spot on with their harmonies. They are going to need to show off some good vocals to pull off ‘Sorry Seems to Be’ though but once they avoid the cheesy performance, they could be the surprise package of the night and get some glowing references. The jury is out on this one. Don’t think either song will really suit him and that Beyonce song is probably the least know of her 4 songs on show despite it getting 131 million Youtube hits. He will put his own stamp on both songs but hope he doesn’t get lost in them. He really is a contender for bottom 2 though because he will need to nail both of these performances if he is to stand out from the other 3 semi-finalists. I’m not sure Nicholas can pull off Halo. The chorus is very prominent in this song and he doesn’t have the vocal range to reach those high notes, so he might struggle with this one. Louis is proving himself to be a pretty terrible mentor with his song selections. He already gave Nicholas ‘The Climb’, and it showed him to be trailing Joe McElderry in terms of talent, so now he gives him the song that literally transformed Joe into the X-factor winner meaning comparisons will be drawn again. He’s making it hard for Nicholas to stand alone in this competition and not be compared to someone else. Joe’s version is our Flashback Factor for this week. At the end of the day, the producers have already decided which 3 acts they want in next week’s final. As of now, they have yet to confirm whether they are going to have a bottom 2 and a sing-off, or leave it straight down to the public vote. Sam and Nicholas look to be assured of their place due to their overwhelming popularity and support, and it seems like Rough Copy and Luke could sing “Old McDonald had a farm” because it really seems like they’ve been chosen for the drop this week. Just to add some insight into how the judges sway things the way they want. Union J were sent home last year in 4th place after receiving the fewest votes. There is not one shadow of doubt that if they there was a sing off last year with Christopher Maloney, then he would have been sent home because every judge wanted him gone, but the producers didn’t. The scenario was reversed in Series 7 where the producers brought back a sing off out of the blue and ended up putting Cher Lloyd through at the expense of Mary Byrne where if it went to public vote, it would have been Cher sent packing with 11.57% of votes compared to Mary’s 14.99%. The producers really do what they please as the decision to have a sing off was only announced on the Sunday night after they had access to all of Saturdays votes along with half of Sunday. So who are we punting on? We know from the bottom 2 over the last 3 weeks, that Rough Copy have polled more votes that Luke in 2 of those 3 weeks, and the week that Luke polled more votes, was the week that he had One Direction helping him so it does seem that Rough Copy are more popular. I think if the powers that be decide they want to do a sing off, then in my opinion, it’s to add another safety net to help secure Rough Copy’s place in the final and sending Luke home one the final table bubble. I’m thinking it’s a bottom 2 combo of Luke and Rough Copy, but I don’t like the 13/10 odds. I’m going to go for Luke to go @ 9/5 with Boylesports because I really feel that Louis won’t have 2 acts in the final, and that even if it did end up a Luke v Nicholas bottom 2, I think it gets sent to deadlock and Nick will have the public backing. My other bet is one I’ve not did before and it’s 1st act announced safe, Nicholas @ 3/1 with Betfred. This is quite attractive odds if I’m right in what I’m saying above. I think it will be Luke v Rough Copy bottom 2 so that leaves only Sam or Nicholas to be announced safe. It’s allegedly ‘In no particular order’ so why shouldn’t they give Sam a sweat and put Nicholas through first? The one thing it might do is put an element of doubt into all the Sam followers so I don’t think the 3/1 odds is correct so it’s worth a small punt. The final will be a much more entertaining affair with Rough Copy involved so I think in order for it to be the spectacle they want, they need to have an act that’s slightly different to the others.